Fifth Angel is an American heavy metal band from Bellevue, Washington. Fifth Angel was formed in the suburbs of Seattle in late 1983, specifically, in the Bellevue area. The band's initial lineup consisted of Ted Pilot (vocals), James Byrd (lead guitar), Ed Archer (rhythm guitar), Ken Mary (drums) and Kenny Kay (bass). John Macko replaced Kenny Kay on bass in 1987, while Kendall Bechtel replaced James Byrd on lead guitar. Fifth Angel was formed in the suburbs of Seattle in late 1983, specifically, in the Bellevue area. The band's initial lineup consisted of Ted Pilot (vocals), James Byrd (lead guitar), Ed Archer (rhythm guitar), Ken Mary (drums) and Kenny Kay (bass). John Macko replaced Kenny Kay on bass in 1987, while Kendall Bechtel replaced James Byrd on lead guitar. 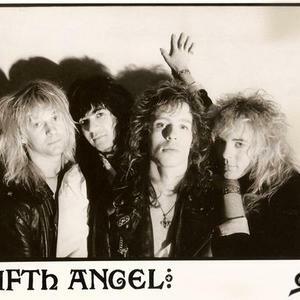 The group released a self-titled album Fifth Angel in 1986 on Shrapnel Records, which was re-released on Epic Records in 1988, with a re-mastered sound and a different cover. In 1989, the follow-up record, Time Will Tell, marked the end of the band, with its members going their separate ways by 1990. McCormack left the group in 2011, along with announced lead singer David Fefolt (the latter performed on some demos, but never actually performed live or officially recorded with the band). The group is in the midst of demoing new material, but operates on a part-time basis as the band members' schedules allow.